Browse the Master Lock video library categories below to learn more about storage security products. Learn more about Master Lock Select Access® Key Lock Boxes. Introducing the NEW Master Lock 5900D SafeSpace® Portable Personal Safes. Introducing the NEW Master Lock 2120D & 2120DWD SafeSpace® Computer Locks. 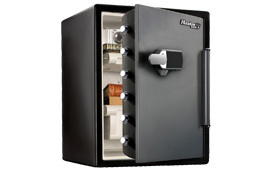 Learn more about Master Lock fore and water resistant safes and chests.